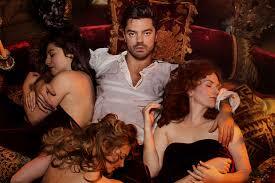 Took Child Two to see The Libertine at the Theatre Royal, Haymarket last night. 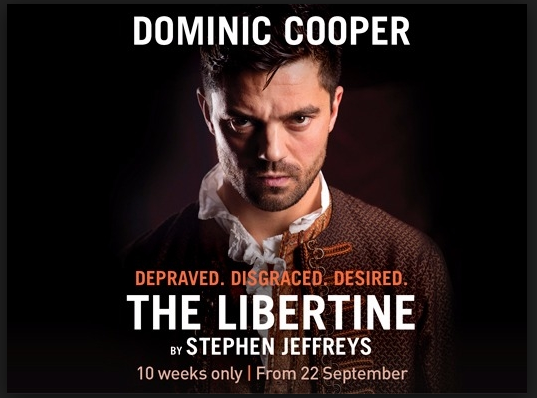 This was partly to bolster her upcoming uni English Lit interviews, since the play’s anti-hero, the Earl of Rochester, was the inspiration for lots of restoration baddies – and partly because it stars the rather lovely Dominic Cooper. You probably remember Cooper from Mamma Mia, when he played the sappy love interest ignored by Amanda Seyfried as she auditioned three old guys for the role of father (what a Freudian nightmare; what a wonderful film). Thank goodness he has grown up into a different and altogether more brooding prospect than the toyboy who pranced around in flippers and got stood up at the altar. Lord Rochester, the prototype hard-drinking rakehell who ran through his own and his wife’s fortunes and died at 33 of venereal disease and alcoholism, is straight out of the mad, bad and dangerous to know box, and Cooper seemed perfect in the role. We weren’t all that convinced by his sudden limp and descent into decrepitude – one moment he was energetically disporting himself in the whorehouse, the next he was prostrate on a sofa – but otherwise it was all there – the wit, the filth, the introspection and the bitter self-loathing. His wife was played by Alice Bailey Johnson with the curious intonation that Darcey Bussell uses on Strictly – a little clipped, a little patronising. And Ophelia Lovibond, Izzy from W1A, was the great love that he ended up resenting. One of the best moments was a wonderfully harmonious little song from all the female cast members about dildos – very funny and probably not something you’d like to sit through with a maiden aunt. Child Two and I sniggered mightily though. Fun, sad and serious.